We went on our annual Apple and Pumpkin trip this weekend. For the past several years, we go to NJ to go apple picking at Strawberry Hill Farm and get pumpkins at a farm's self serve roadside stand just down the street. It was so much fun this year with Grace. She was old enough to pick a few apples herself and, as you can see below, enjoy the apple yumminess. That apple in the photograph kept her busy for a good 15 minutes (a very long time in toddler time). 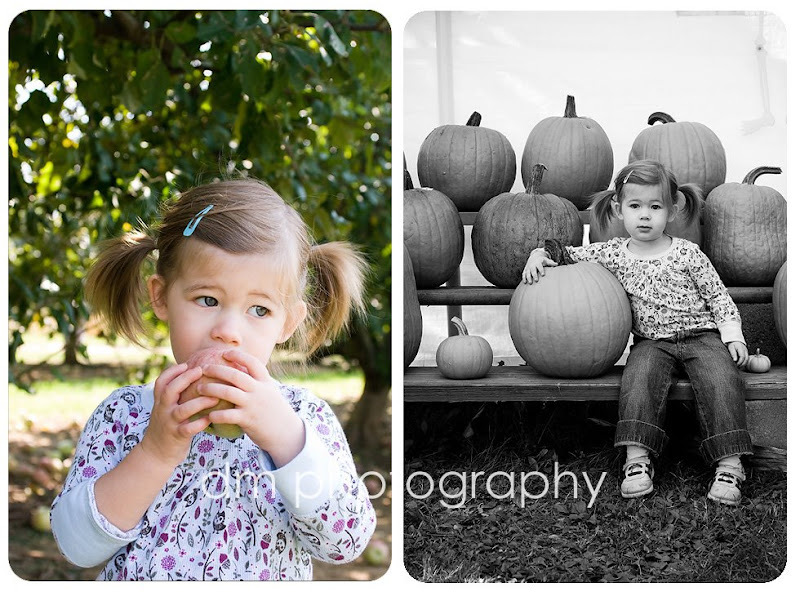 And maybe she will be like her daddy and have the skill of picking out the perfect pumpkin. She seemed to really like the one next to her. What an adorable group of pictures (as always). It took me a while to catch up on your blog. You have been very busy, I see, with your business. Good for you! We will be in town on the 18th for Scarecrow fest, we'd love to see you.